Think of the Quicktionary TS Lite, also known as the Quicktionary 3 Lite, as your own personal French and Spanish language tutor in your pocket. 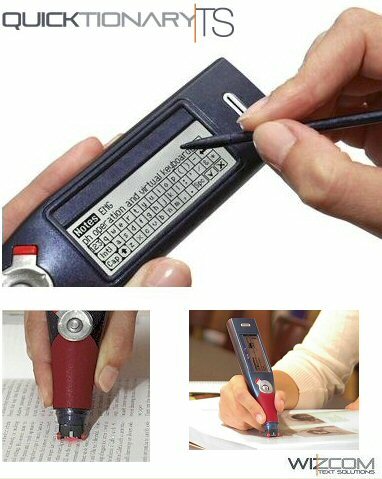 The Quicktionary TS from Wizcom is a portable hand-held scanning translator that can scan a word or a full line of text and provide immediate word-by-word translation, including idioms and phrases. The pen provides audio pronunciation of individual words or full lines of text in English. The Quicktionary TS Lite is fitted with the most popular two-way dictionaries: English-French-English , English-Spanish-English. Words do not have to be just scanned in - you can also enter words efficiently using the new touch-screen interface. What's more, the Quicktionary TS Lite comes with word games included, so you can actually learn the words you needed to look up. Practice your vocabulary using the included word games. Ideal for language students, people with a 2nd home abroad, holiday-makers, researchers, business people and others. Translates French & Spanish in seconds! Simply switch on and go - no set-up required! Portable, hand-held scanning translator with an easy to use touch screen and icon-based menu. The Quicktionary®TS can scan a word or a full line of text and provide immediate word-by-word translation, including idioms and phrases. Stay focused on your reading while the Quicktionary®TS helps you interpret your text quickly and easily. Save the time you would have spent searching through paper dictionaries or typing into electronic dictionaries. Take the Quicktionary®TS wherever you go. This small, portable, handheld device is designed to fit in your pocket. The Quicktionary®TS is an ideal tool for anyone in need of multilingual support, such as students, travelers, researchers and business people. Audio word pronunciation with Text-to-Speech (TTS) technology using built-in speaker or earphones (available in most products). Recognition of a wide range of printed font types and sizes (6-22 points, up to 8mm) , including inverted text on contrasting backgrounds (except red on white, white on red, blue on black and black on blue).